In a Senate floor speech announcing her support for now-Supreme Court Justice Brett Kavanaugh, Maine Republican Susan Collins applauded the “#MeToo movement” as “needed” and “long overdue.” She then proceeded to hand a lifetime appointment to a man accused of sexual assault and harassment by multiple women. According to Page Six, Jodie Foster was saved from a “#MeToo moment” by child stardom and a supportive mother. USA Today recently ran a series of tips to help small businesses avoid “Me Too-type incidents” in the workplace, and also found that everyone was talking about the “#MeToo moment” in the movie Eighth Grade. The ubiquity of sexual violence and coercion in our everyday lives has never received such focused attention, but the cultural shorthand born in the wake of the #MeToo hashtag—which exists in conversation with the foundational work of civil rights activist and educator Tarana Burke’s me too movement—can also feel like a strange kind of emptying. What started out as a punch in the gut, a collective push to make visible both individual experiences of abuse and the complex systems that enable abusers, has also turned into marketing copy or a reference to be checked off in perfunctory political speeches. What we’re often left with then, a year out from the hashtag, is an explosion in coverage of #MeToo, but a narrowing of how we talk about sexual violence. One has, in many ways, slowly supplanted the other. Burke has said that she started the me too movement (which is distinct from and predates the hashtag by more than a decade), and the nonprofit Just Be Inc., in response to what she saw as a failure to speak—openly, candidly—to a 13-year-old girl who had come to her with her story of sexual abuse. What motivated Burke to start the work of me too was what she saw as a failure to hear, and a failure to speak. But as media and political narratives that lack that nuance and specificity seem to overtake the substantive reporting and analysis that first expanded on the movement she built, it feels in many ways like a return to that moment: masks back on. I reached out to Burke to talk about how she has experienced the last year, and to hear her thoughts on the ways our conversations about sexual violence have deepened and the ways they haven’t. When I asked her how she navigates this tension—of unprecedented media coverage putting a spotlight on her life’s work while at the same time flattening much of what that work entails—Burke offered: “We cannot as a movement depend on the media to catch up with us before we decide that we’re legitimate. The way that those things live side by side is that they just do.” The organizing comes first aways, she said. JEZEBEL: In the year since the hashtag first emerged, we have seen a huge expansion in coverage of sexual violence and the different forms it takes. I wonder where you see us now? 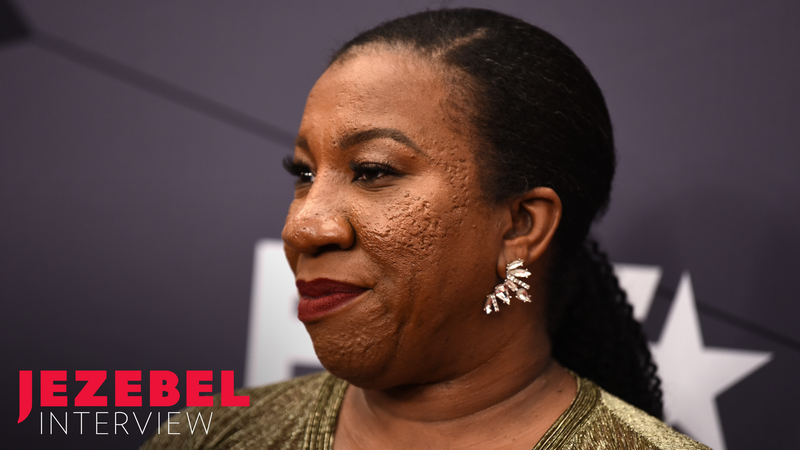 TARANA BURKE: This has been a year for the record books, right? I think that, certainly, from last year to this year, the level of awareness has grown exponentially. So I think it’s two things: on the one hand, there’s been a great shift in the way we talk about sexual violence. And the fact that we talk about it at all. The conversation about sexual violence, in general, is expanding. We have never really had a national conversation about this. I think that’s probably the biggest change. But on the flip side, there hasn’t been enough of the right kind of conversation, if you will. There hasn’t been enough conversation about the needs of survivors, of what people actually need. Solutions. It’s been mostly about perpetrators. That has been really difficult, I think. But I could not have asked for, I could not have paid for, the kind of publicity and exposure that has been brought to this work. So I take the good with the bad. That was one of the questions I had for you; what you describe as the flip side. About how the attention that came with the hashtag has been transformative, but you’re also not seeing the kind of conversation you would have hoped could develop out of that moment. That, to me, is the scariest part. That we would have a moment that has so much potential and then we end up squandering that potential by having circular conversations that don’t amount to much. That makes me nervous. One thing I have noticed since the emergence of the hashtag is a tendency of mainstream publications to use #MeToo as shorthand. There is a lot of talk about “#MeToo moments” and “#MeToo encounters” that create a kind of blur around the forms of violence that are actually being written about. This is a really strange development, in a way, because you have described the story behind the me too movement as being about hearing and speaking with specificity about our experiences of violence and abuse. So we are watching #MeToo become a kind of common language, but it’s sometimes an empty language. They have definitely watered it down. I had a really interesting conversation with a male celebrity who referenced somebody as being “me too-ed.” In his defense, he wasn’t saying it to poke fun at the movement itself. But when we had a private conversation about it—I was disappointed because I felt this person understood based on conversations we’d had—he asked me how it was offensive. He was surprised I took offense to it. I said, you know, the problem here is that it takes away from what the words are for. But it also has this connotation as if there’s a target on a person’s back or a way that people get entangled. Like they’re being ensnared in something: Oh, they got me too-ed. All of that makes it harder to do our work. I thought about this again after Henry Cavill said what he said. About feeling like it was harder or somehow scarier to date now. I mean that was just a dumb comment. But the important part is that it is reflective of what so many men think and say now. Because they jump to the part that’s like, Oh well now we’ve got to act different. All these women are super sensitive. It just highlights how the media talks about #MeToo, and I think it’s to your point. I wonder how you see these two things living side by side, then. Both the positive exposure that has put your anti-violence work and certain survivors’ stories in focus, but that has also kind of emptied and distorted the nuance and focus of those things at the exact same time. I think of these things all the time. Part of what I tell people is that this is about how we as a people, and we as survivors, shift our understanding of how we build movements. If we are depending on the media to completely shift the narrative and all of a sudden really dig into the breadth of stories that are possible—if we are waiting for that to happen in order to feel validated as a movement, then we will be forever stifled. I think what has to happen simultaneously is those of us who are committed to this work and have some level of profile in this moment have to be committed to narrative change. So I try to frame the work for people and be consistent about that. If you stay consistent and keep your head down, keep moving forward, I feel like people get it after a while. That to me represents a check on our side in terms of looking at evidence of the narrative shifting. People can look at that and say, Oh, this makes sense. We cannot as a movement depend on the media to catch up with us before we decide that we’re legitimate. The way that those things live side by side is that they just do. I wonder where you see this going next? We know the reality, we know the statistics, we know the community, we know the landscape. It’s up to us to strategize about how we move forward despite the fact that the media is saying one thing. Because the media will come along, eventually, at some point. People who are thoughtful and who really committed to the fullness of the issue will pick it up and run and help us get traction. While I’ve been on the cover of magazines and at red carpet events, I’ve also been working in collaboration with other people on the ground who do this work. I’ve been developing programs. You know what I mean? I can’t rest on my visibility being the work.